Originally from Mobile, Alabama, Cleve attended college at Auburn University, where he received his bachelor's degree, master's degree and his PHD, in Adult Education. He then moved westward, following his passion and fascination with the cowboy way of life. He spent his career working for various universities (University of Idaho and College of Southern Idaho) teaching adult education. After years of drawing and painting "flat art" (paper and canvas art), Cleve began carving in 1986, after receiving a set of tools from his family. In his early carving journey, he discovered a love of caricature carving. He loved seeing the humorous side of a situation and rendering that in a carving. He has carved many subjects in carving, but his love of the caricature genre in general, and cowboys in particular, always led him back to finding the funny side of the western way of life. Cleve cites his brother as a major influence in his cowboy carvings. His talent manifested itself rather quickly, and within a few years, Cleve began teaching carving classes. He saw a need to help other carvers understand anatomy, how to read wood grain, basic layout of a carving, and how to render a scene in wood. Cleve has taught classes in many locations across the country. The number of successful carvers who received their start in one of Cleve's classes, or improved their skills after taking one of his classes is long and distinguished, and includes some of the best caricature carvers in the country. In 1995, Cleve was inducted into the prestigious Caricature Carver's of America organization, whose membership boasts some of the most famous and accomplished caricature carvers in North America. He has also authored 5 carving instruction books, including: Cowboy Carving with Cleve Taylor, Carving Motorcycle Riders with Cleve Taylor, Carving Mountain Men, Hangin' in There, and Carving Fishermen and the Tall Tale. 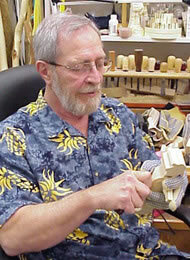 Cleve was inducted into the Idaho Woodcarvers Guild's Hall of Fame and awarded with a lifetime membership in the club. He is still an emeritus member in the Caricature Carver's of America organization. Today, retired from carving but still involved in creating art and inspiring others, Cleve spends time with his lovely wife, Sandy, at home in Idaho, where they enjoy the retired life and attending all the activities of their grandchildren. Cleve's legacy in teaching and inspiring others to follow their passions, are remembered and followed by all who have spent time with him. Below are just a few of Cleve's carvings.